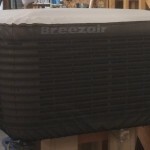 Evaporative Cooler Cover | Protects From Debris & Helps Eliminates Drafts | A/C Covers Inc. Your vinyl “Swamp Cooler Cover” is specially designed to fit your unit like a glove, protecting it from foreign debris and helps eliminates drafts. Your “Swamp Cooler Cover” should NOT be used while the unit is on. Price is subject to change based on size of the unit.